Self-Priming Pump is a hygienic side-channel design sanitary pump, it is applicable by food processing, biopharm and chemical industries. Self-priming pump is specially designed for pumping materials what containing air or gas, and it can be also be used for negative suction with prior priming as well as with filtration equipment. 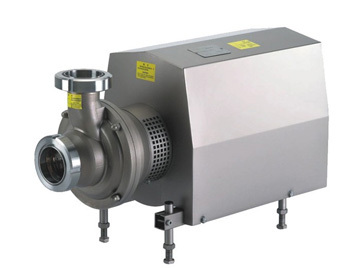 Wellgreen self-primping pump can be used for wine, fine oil, syrups, volatile products such as alcohol, acetone and other solvents, or other materials which temperature close to boiling point. However, the mainly using field of self-priming pump is for CIP returning. Cover of motor is made by cold-formed plate. Stainless steel investment casting inlet-body and impeller. Mechanical sealing prevents contacting between the springs and the pumped fluid. The impeller is housed between the inlet body and the venture casing, it rotates in conjunction with the pump shaft. The rotation of the impeller and arrangement of the side channel, creates a negative pressure inside the inlet body, which generates the suction force of the pump. At the same time, the fluid receives energy in the form of kinetic energy and pressure energy, and this impels it through the impeller casing. Inlet&Outlet Connection: Tri-Clamp, Threaded, Flanged to DIN, SMS, 3A, RJT etc. 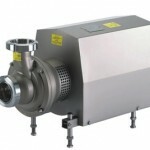 *For more information about sanitary self-priming pumps, please contact us.